It has been a long-term goal of the CRCA to acquire the floodplain and wetland areas along Little Cataraqui Creek in the City of Kingston since the late 1960s. The land has been bought as it becomes available on the open market. The purpose of this ongoing acquisition project is to protect the floodplain and the provincially significant wetland from being developed. This area provides wildlife habitat, flood storage and green space in the middle of an urban area. The acquisition plan includes all of the floodplain and wetlands along the main branch of Little Cataraqui Creek between Lake Ontario and Little Cataraqui Creek Conservation Area, which is located north of Highway 401. Currently, the CRCA owns most of the east side of Little Cataraqui Creek between King and Princess Streets. We also own some land along the west side of the creek as well as a small piece of land at the corner of Portsmouth Avenue and John Counter Boulevard. Two other public landowners, the City of Kingston and the Correctional Service of Canada, own significant amounts of floodplain and wetland areas along Little Cataraqui Creek. The CRCA lands have been known by various names over the years including Little Cataraqui Creek Valley Lands, Cataraqui Marshlands Environmental Protection Area and Cataraqui Bay Marshlands Conservation Area. In the early 1970s the Rideau Trail Association developed the Rideau Trail on the part of the CRCA property on the east side of Little Cataraqui Creek between King and Princess Streets. The Rideau Trail is a hiking trail that stretches from Kingston to Ottawa. The trailhead was located on the property just north of King Street. In 2004 the CRCA reviewed its plans for the only developed part of the property which is the location of the Rideau Trail trailhead adjacent to the Cataraqui Golf and Country Club. This review was conducted as a result of a land swap with an adjacent landowner. The entrance was relocated, the parking facilities were redeveloped and new signs were installed. 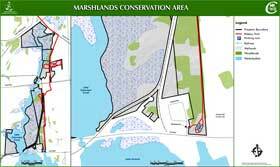 The CRCA also changed the name of the property to Marshlands Conservation Area to avoid confusion with Little Cataraqui Creek Conservation Area which is located north of Highway 401. Most of this area is kept in a natural state. The only facilities that are planned for these lands are the existing Rideau Trail and the parking lot at the trailhead on King Street. The trailhead provides the main Kingston access to the Rideau Trail which has 387 km of cleared and marked trails between Kingston, Perth and Ottawa. The Rideau Trail is maintained by volunteers from the Rideau Trail Association. The CRCA maintains the parking lot and surrounding area at the trailhead. 7:30 a.m. to dusk daily. is located at 1214 Trailhead Place just off King Street in Kingston. The CRCA is a partner with RiverQuest. To find out more, click on the logo below.